Everyone at her memorable Memorial was entranced by her unique ability to make you feel special. "best friends" and everyone there was entranced by her unique ability to make you feel special. Jim Florette reflected "always at an opening, always at a closing!" "She was a wild woman" someone murmured among the throngs perusing a table covered with the most astounding pictures, memorabilia and news articles from Maggie's "glamour days" from the early 50's Supper Club, Dancer, Summerstock, modeling career to Maggie's 2005 New years glasses. The mood was convivial and the food divine as her "girlfriends" and her "queen friends" mixed and matched. Seemed like all of the Cherry Grove Arts Project was there and it was most fitting for this most theatrical person that Panzi presided over the Memorial opening with "welcome to the theater too bad Thom Hansen couldn't be here". "The Grove without Maggie is like Paris without the Eiffel tower" Panzi reflected. "Maggie was the heart and soul of Cherry grove" Panzi, who shared drinks with Maggie on Panzi's 21st birthday, closed with "Maggie is like a Saint in my heart". before many got up and reminisced about Maggie. Those closest like Audrey who was "filled with joy that she shared so much of her life with me", Barbara Dowd, the "Weeper Sisters" Susan & Ruth Freedner, Tim Webster "Maggie would warm you, support you and make you feel great", Lois "I thought it was just me who felt special" and even her nephew, who grew up being told Maggie & Dorothy were the "exotic " relatives, adding "they were ones he always wanted to see". A movie was shown of clips from Maggie's performances onstage in the Grove reminding what a terrific actress she was. Thanks for coming to Maggie's Celebration. An article in the Tide would be wonderful. Maggie loved an audience and I know she would be pleased. 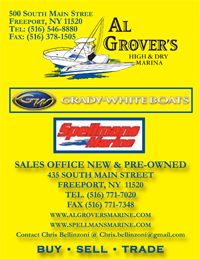 When did you first come to Cherry Grove? Betty Lee brought me to Cherry Grove in 1950. She had a company that created shows for television. What was the Grove like then? It was like a gay country club. There were a lot of show business people, writers and people in the fashion world. Miles White and Oliver Smith, well-known on Broadway for staging and lighting, had rented a house named "Shadows" near the Bridge of Sighs.Kay Guiness had been in Cherry Grove since the 1930s and looked askance at the young crew coming from Manhattan who started naming their houses "Cats on a Hot Tin Roof" and "Four of a Kind." There were well known people like Natalia Denisi Murray, Alan Prescott, Janet Flanner (Genet), and occasionally people like Anna Magnani, Tennessee Williams, Diana Barrymore and a drunken Veronica Lake. The beautiful beach and because it was gay. There were some straight people from the mainland and they were so nice. The theater was also a big attraction as well as the theater people in the Grove. George Freedley, a Cherry Grover,was the treasurer of ANTA then and was also a Broadway critic. Did you get involved with the Arts Project right away? My first show was "Bertha of a Nation" after Bertha Belmore who had two houses at the Grove - "By Jupiter" named after the Broadway show she was in and her guest house that became known as "The Magic Flute." What prompted you to get involved with the Arts Project? It was great fun and it was literate. Rehearsals were almost more fun than performing. We touched upon your experiences in the Grove, however; we all have our own personal history outside of "paradise island". What brought you to New York? I was living in Kentucky and was chosen by a theater company in Cambridge Massachusetts for summer stock at Plymouth Beach.I joined their year-round company as their character ingénue and year-round stock at Harvard Square. I had several affairs there and my Phys. Ed. Teacher from the U. of Kentucky came to visit. I realized I was becoming very actively gay and didn't know what to do about it so I decided to move to New York City. I came by bus and landed in the middle of the West 40s with $20. and a dime. I lived with four Broadway gypsies and they took care of me. I took an evening job at CARE downtown so I could audition during the day. I immediately had an affair with a woman at CARE and learned about New York's gay bars. I left CARE after a few months and got a night job teaching dancing at Arthur Murray's home studio and doing some of their commercials. In the mid-50s I went into the concert management business working for NCAC. Everything had to be fun and the concert business was fun. Birgit Nilsson was one of our artists and she hit it big at that time. Given the long history you have with the Arts Project, what have been the biggest changes over the years? What advice would you give the board to spark new interest and attract new members to the Arts Project? Take the personal approach. When you meet new people, tell them about the Arts Project and encourage them to get involved. Introduce them to people on the walk, at plays, social events, etc. What is your favorite Arts Project Event today? Certain kinds of theatrical shows like the show about the two men who grew old together or Blue Fish Cove. I love the Art Show and I think it's vital in terms of maintaining the quality of the activities. Casino is fun, too. But the original draw was the Art Show. In closing, pick the three most vivid memories of you Grove experience? The arrival of Anna Magnani when she visited Natalia Murray and getting to know Janet Flanner who was Genet of "The New Yorker." I also remember the Bestigi Ball given by Miles and Oliver at Shadows.their house on the Bay. It was decorated to a tee. A beautiful lesbian named Bea Greer came as Cleopatra. She came out of the bay on a barge pulled in by Nubians in black paint. Betty Lee and I went as pirates and arrived in a gondola. Those were great days! Editor's Note: This interview was conducted in June 2005. We unfortunately lost our dear friend Maggie in October 2005. The Arts Project and the Cherry Grove Community will be forever grateful for having her as a part of our family and for having the privilege to capture her thoughts and memories in this interview. When I was on the Arts Project Board, we decided to interview some of the "old Grovers" for the webpage. Maggie was our first (and to date --only) interview. She didn't like that picture much. It was a tribute to Maggie that so many people wanted to help and be involved. Barbara Dowd and I were the "organizers" and it was a labor of love. Audrey Hartmann (who owned the Fire Island house w/Maggie) helped with the planning. Audrey's nephew, Adam Cricchio, designed the announcements and the program. Eleanor Eick spent hours on the photo display and helped with the room arrangements and set-up. Although they weren't able to attend, Patricia Goff and Diane Romano provided beautiful archival photos of Maggie. Harold Seely and Susan Freedner provided videos of the old shows. Rae DeStefano, Tim Webster and David Bullock turned the videos into a DVD for Maggie's "Encore." Matt Baney and Wendy Lewis provided the DVD equipment and technical assistance. It was supposed to end with "I'll Be Seeing You" and the photo of Maggie with her back to the stage. Panzi was right on when he said Maggie never had her back to the audience. Lois Heikkala, Elaine Lukash, Bud Hendricksen, and Lucy Lloyd helped set up. Last but not least, Matt Baney and Luis Valentin helped load the car when the event was over. Tim Webster made a DVD of the service that I just watched and made notes as best I could for quotable quotes. Audrey Hartmann: Talked about the long history she had with Maggie having met when they both worked for Sol Hurok in the 50s. they lived together from 1961 - 1978 and built their house in Cherry Grove. They went their separate ways for a number of years and then Audrey returned to Cherry Grove and resumed life with Maggie. Possible quotes: "I know Maggie is smiling down on us saying, 'I can't believe it. Practically standing room only.'" and "Even though we separated after many years, we endured a friendship and love. She cherished her friendships at the Grove." Barbara Dowd: "The last years of Maggie's life she was part of our family. Someone told Lois that it's very hard to lose people who love us. Maggie loved us unconditionally, she loved Cherry Grove and certainly Cherrgy Grove loved her back. Maggie was a woman of very firm convictions. Her relationships with each and every person were so special." Barbara read a letter from Maggie's cousin who was unable to attend because of illness. The cousin recalled that as a child, Maggie was always looking for an adventure and ran around the neighborhoods of the small town as if she owned them. Leading her visiting cousins on an adventure, Maggie announced they would go to the movies. The cousins were concerned because they had no money. Maggie assured them it would not be a problem Since her father was a preacher, she got in free. Barbara also talked about Maggie's love for animals. Talking about our miniature dachshund Gracie who is very vocal, Maggie said, "I think I'm learning her language." Susan Freedner: "Ruth (my twin) and I often entertain in the community and for that we owe Maggie. One day she knocked on our door and said, 'Come down to the Community House. We need you. We're going to do a show." Susan also recalled that in her first show, "Radiola," she was supposed to sing a love duet with a fellow cast member. The director asked her to show more feeling and act as if she really cared for the man. Susan said that she just couldn't do it. Overhearing the conversation, Maggie said, "Act as if." Susan replied, "I just can't do it." Maggie said, "That's why they call it acting." "Maggie instilled in me a great love for Cherry Grove and for the people of Cherry Grove." Tommy: Shared a poem he wrote entitled "In Memoriam" about a morning in early November when he took his dogs to the beach. Maggie was there and shared her wonder ...a beach with no footprints. "Solace and meaning is what she's left me with. Not bad for an old broad." Leonard Fink: "My wife and I started an automated phone service in the 80s. Maggie was referred to me as a possible right hand person. We worked together for 16 years and became very close. I know for a fact our business wouldn't have succeeded as it did without her." He also shared about a Christmas gift from Maggie. "Every year we would get a package from Maggie...Bailey's Irish Cream. I said, 'We don't like Bailey's Irish Cream.' Maggie replied, 'That's ok. I liked it." Tom Holden: "We built a house at Fire Island and called it 'Les Boys.' Maggie ruined all that by walking in and calling it 'Less Boys.' She'll always be in my heart." Don Hester: "We were the token straights at Cherry Grove. Maggie was always like an aunt to our kids and always very protective of them." Judy Hester: "Maggie was a frequent visitor at my mother's house in Cherry Grove. They were great friends. Mom died in that house and when we arrived there after getting a call from Walter and John, Maggie was sitting with her. Every year Maggie and I remembered that day. Mother died October 15, 1990 and Maggie died October 15, 2000. Audrey told me that a few days before her stroke, Maggie was talking about Mom." With that, Panzi announced that he was going to a casino to put his money on 15. 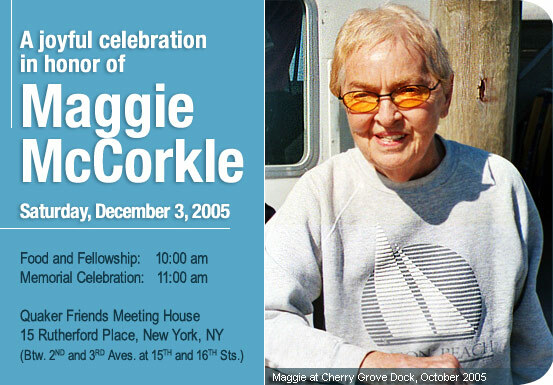 Julie Takton: "My whole early adulthood was with Maggie McCorkle and what a wonderful time it was. She taught me about unconditional love and so many other important things. I know that wherever she is, she's putting on a helluva show." Jeannie Lieberman: "I didn't know her name but she would find me and distill the essence of the shows for me. Many of the one-liners in the articles came from Maggie." Rae DeStefano: "I've known Maggie a long time but not well until the last five or six years when I got involved with her beloved Arts Project. I think she thought I needed help. She became my kitchen cabinet. One time she told me she loved me and I was so happy." Alice Carey: "It was a cold crisp November day crossing the Great South Bay. Everyone was bundled up and I was just wearing my usual tweed jacket. Maggie looked at me and said, 'Alice, what are you dressed for?' I never forgot that." Jim Florette: "Maggie always spoke her mind--sometimes, too quickly. She taught me to thine ownself be true." Julie Fisher: "I got to know Maggie when my partner, Betsy, and I started a book discussion group which Maggie called a salon. When my partner died, Maggie was very kind to me. She listened to me and allowed me to express my pain. Maggie was very free with her love and caring." Urva: Recalled looking at the stars atop the Community House with Maggie and feeling a special current which they let pass. Nevertheless, the memory makes Urva smile. Adam Cricchio: Talked about the large part that Audrey and Maggie played in his young life. They were thought of as the "exotic" members of the family and were always so much fun. He especially appreciated how they opened up their lives to him when he was a young man. They introduced him to Cherry Grove and he developed a better understanding of other life styles. Lois Fisher: "I think one of the reasons I loved Maggie so much is that she made me feel so very special. Until now, I thought I was the only one." Lois reminisced about meeting Maggie shortly after moving to New York in 1977. Maggie introduced her to Fire Island and they eventually became the closest of friends. " I can hardly remember a day in the last 20 years when we haven't seen each other or at least talked on the phone. To me she was a star and always will be." The Celebration ended with The Serenity Prayer. Tim Webster also spoke but wasn't on the DVD since he was the cameraman. I think Tim talked about how much he appreciated Maggie's encouragement and support when he was Homecoming Queen. Unfortunately, I don't know Tommy's last name. He's knows as Tommy Tush in the Grove but I know that's not his real name.